What’s the purpose of digging a hole and then re-filling it halfway or even all the way 15 years later? Child and youth services providers and families are asking this question as they review the “new” dollars for child-serving ministries in the 2017 BC budget. Over the last 15 years provincial child-serving ministries, school districts, post-secondary institutions and community service agencies serving children, youth and families had their provincial funding slashed or squeezed. Meanwhile inflation, growing service needs and increased government-imposed fees and costs forced them to cannibalize and reduce their services to balance their budgets. They were made to dig the holes. The dollars now suddenly made available for education and child welfare services, while welcome, are insufficient to make up for the damage done to children’s lives. Families, students and charitable donors were asked to step up to fill the holes—to raise money for school supplies, for food programs, for housing, for tuition—or to keep children from falling in by volunteering to do child care, tutor or mentor them. But no matter how fast they worked the holes kept getting bigger, deeper, and more difficult to avoid. BC Budget 2017 looks like an attempt to deliver a small truckload of dollars to fill the most noticeable budget and service holes created by the cuts and unfunded extra costs. Should we be happy? Grateful? After watching the impacts on the lives of a generation of children when services weren’t there for them, families and service providers instead feel frustrated and saddened by the windows of opportunity missed – and the unfairness for children born at the ‘wrong’ time in BC. In a province as wealthy as BC, with five years of surplus budgets, there is no excuse for leaving so many children and youth down in those holes during their crucial developmental years. And the dollars now suddenly made available for education and child welfare services, while welcome, are insufficient to make up for the damage done to children’s lives. Nor are they enough to meet long-identified needs. Between 2008 and 2013, the troubled Ministry for Children and Family Development budget lost $100 million in inflation adjusted dollars. The budget shows a lift for this ministry of $145 million in 2017/18, followed by a decrease in the next two years. This one-year increase is hardly game-changing after more than a decade of under-funding at the expense of vulnerable children in our care. The annual additional investment needed to properly support youth aging out of care every year alone has been estimated at $57 million – and this would be a bargain since it is costing us over $200 million annually to pay for the adverse outcomes from our failure to support them. The largest percentage lift within the ministry budget is a 20 per cent increase ($16M) for child and youth mental health services. With 70 per cent of BC children and youth living with mental health problems not receiving the treatment they need, this is a welcome incremental step. We know poverty is one of the most powerful reasons for poor health and social exclusion. That’s why First Call: BC Child and Youth Advocacy Coalition publishes the annual BC Child Poverty Report Card. As noted in the BC Poverty Reduction Coalition commentary by Trish Garner, this budget doesn’t even mention the word ‘poverty’. Despite repeated recommendations from the legislature’s Finance and Government Services Committee and a host of community organizations, no poverty reduction plan was announced in the budget. Social and disability assistance rates remain incomprehensibly low, and child care remains so expensive that thousands of parents either can’t afford to work – or wonder why they’re working only to cover the exorbitant fees for care. Budget 2017 missed the opportunity to invest in the $10-a-Day Child Care Plan, a ready-made poverty reduction solution and job creator. The cut in MSP premiums announced for 2018 will take many families almost back to what they were paying 15 years ago, with the added bonus of children now being free. But remember this does nothing for families who are already poor enough to qualify for full Premium Assistance. They’re still in the hole. We know poverty is one of the most powerful reasons for poor health and social exclusion. The hole-half-filled analogy also applies to the increase in public education funding for teachers, which was compelled by a Supreme Court of Canada decision that chastised government for bad-faith bargaining with the BC Teachers’ Federation. This is because the budget does not address the inadequacy of the per-pupil funding model and the resulting underfunding of non-teaching support staff, facility maintenance, seismic safety upgrading, new classroom needs and many other real costs identified by public education advocates. Families with children in public schools are unlikely to see any relief from the pressure to fundraise for playgrounds and other school essentials. The new back-to-school tax credit that will give a maximum tax break of $12.65 per child, while costing the budget $5 million per year, provides only comic relief. The August 1, 2017 decrease in the interest rate on the provincial portion of post-secondary student loans is a positive, if modest, move towards debt relief, with government estimating an annual savings of $11 million for students and families this year and $17 million in each of the next two years. However in the pattern of giving with one hand while taking with the other, the budget eliminates the Education Tax Credit as of January 1, 2018 in order gain $11 million over two years. The budget also failed to restore the Adult Basic Education Guarantee, leaving low income students and families locked out of the courses they need to lift themselves out of poverty. Ensuring that BC’s children have the basics covered—a good start in early childhood, education and supports that help them through the transitions to adolescence and adulthood; sufficient family income for good nutrition, housing, clothing, and social inclusion; and protection and extra support when needed—is not an unreasonable expectation. There is not a lack of wealth in this province. There is, however, a problem with an unfair tax system that has granted large tax cuts to the wealthiest among us, leaving a significant gap in the provincial revenue available for services that a generation of children and youth needed, but on which they missed out. This has contributed to our status as the most unequal province for family income, along with the unaddressed crises in the cost of basics like housing and child care. BC Budget 2017 is a last ditch and very politically-timed attempt to partly fill in some of the holes dug over 15 years in the crucial services needed to support healthy child and youth development and successful transitions to adulthood. They should never have been dug in the first place. Children’s mental health: Are we paying attention? 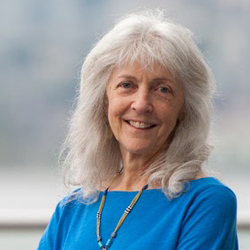 Adrienne has lived, worked and been a social justice activist in Vancouver since 1976. She joined First Call: BC Child and Youth Advocacy Coalition in 2000 and became the provincial coordinator in 2005. Prior to working with First Call, she served as the child and youth advocate for the City of Vancouver, and as the chairperson of the Vancouver School Board for three of her six years as an elected school trustee. Some of her earlier leadership positions included serving as the executive director of Surrey Delta Immigrant Services Society and of Big Sisters of BC Lower Mainland. Adrienne has a long-standing interest in the issues of cross-cultural awareness and racism, women’s rights and the impacts of social exclusion on children and youth in low-income families. Her academic background is in Asian studies and adult education.